*Corresponding author. Tel. : +86 10 58802928; fax: +86 10 58802928. E-mail address: chunhuili@bnu.edu.cn (C.H. Li), yanpeng.cai@bnu.edu.cn (Y. P. Cai). The Laoguanhe River is a major tributary of the Danjiang River, which is the source water source for the Danjiangkou Reservoir (i.e., the source reservoir for the middle route of the South-to-North Water Diversion Project in China). This study was intended to provide scientific decision support to help manage the water environment in the Laoguanhe River and maintain high water quality levels for the water diversion project. 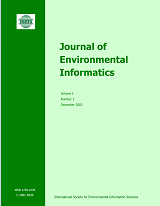 Risk assessment based on water quality simulation was undertaken in this research. The QUAL2Kw model was used to improve the simulations of the water quality of the Laoguanhe River under sparse data conditions. Latin hypercube sampling (LHS) was used to improve flow inputs for QUAL2Kw. The model was used to calculate the water quality risks under several scenarios based on a Markov stochastic process to reflect uncertainty. The simulation results indicated that the water quality of the downstream section of the Laoguanhe River could meet the basic requirements for exporting water to the Danjiangkou Reservoir.